Thanks! It's Müller known from the adventures of Tintin. All my beers have Tintin labels now. Easy to do edits in Windows Paint. I like the Amber Ale recipe. Made it with Hallertau Blanc and will make it again but with Lemondrop. I've just tasted my Bootmaker Toucan with Hallertau Blanc. Very Promising for being only 2 weeks in the bottle! 2019-03-17 evening 2 x 1,7kg TC Bootmaker Pale Ale 1 x 11g Safale US-05 22 liter 2019-03-28 11:00 40 g Hallertau Blanc pellets down in the fermenter. 2019-03-29 20:00 starting coldcrash at +2 °C 2019-03-30 kl 19 gelatine fining into fermenter. 2019-04-05 bottling 33 cl with coopers carbonation drops 2019-04-18 tastes good. not very bitter. small hint of Hallertau Blanc. Searched for info on Brewferm. Old or not, good topic. Muntons St Peter's IPA Made it with slightly less water than instructed and it turned out awesome. Really good kit. Muntons Tiny Rebel Cwtch Made to instructions and it tastes very good just 3 weeks after bottling. Happy that I got 4 kits for the price of 2. Ceramic heater lamp for reptiles is what some use. I'm gonna get a 50 W one myself. Going to the pet shop monday after work. Something like this ---> https://www.amazon.com/dp/B07HQLSTQW/ref=sspa_dk_detail_1?psc=1&pd_rd_i=B07HQLSTQW&pd_rd_w=CAoiL&pf_rd_p=80559f3c-f83b-49c1-8a72-40f936e9df7a&pd_rd_wg=v6KD8&pf_rd_r=VXKWH5HNANRXKXRC8GX6&pd_rd_r=8a8682df-532f-11e9-a577-3bbfcd35dc51 Some people use hair dryers. I've made 2 batches with Coopers Porter. One with honey and one with DME. Both turned out nice and have been getting better with time stored at 9 ºC in my garage. I've got 3 cans Coopers Porter left. 1 is propably going to become a Honey Porter. This might be what happens to the other 2: Thomas Coopers Devil's Whole Ruby Porter Toucan 22 liters. ﻿Est. Original Gravity (OG): 1.065 Est. Final Gravity (FG): 1.015 Est. Alcohol By Volume (ABV): 6.55% 2 * Thomas Coopers Devil's Half Ruby Porter 0,5 kg wheat DME 0,5 kg light DME 2 * Nottingham yeast or other high attenuation. ﻿ I'm thinking this will be nice to drink by christmas. Any input or ideas are more than welcome. 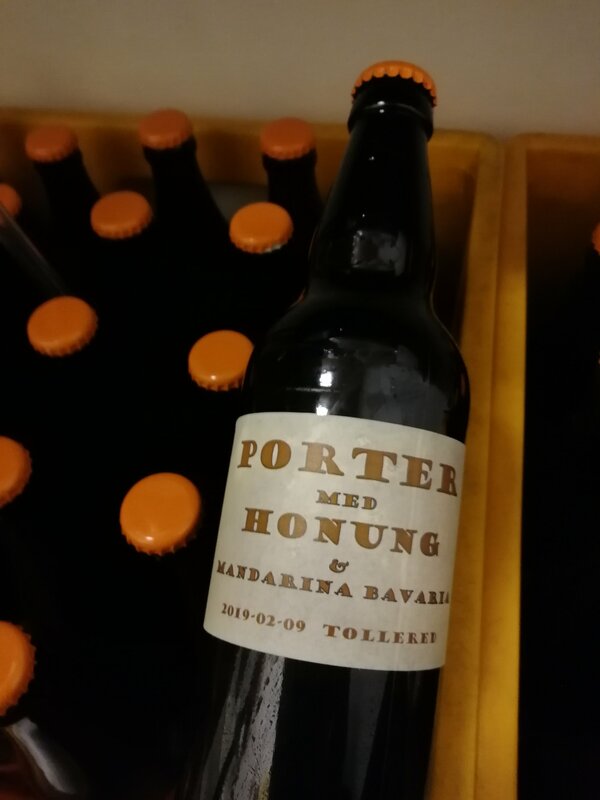 My idea for the next experiment: 23 l 1.7 kg Coopers Porter 0,5 kg Wheat Dried Malt Extract 1,4 kg honey with character 250 g lactose 50 g mandarina bavaria 5 minute hop tea 15 ml magnesiumcarbonate 1/2 tsp (2.2 grams) Wyeast Nutrient Beer Blend Mangrove Jacks M15 Empire Ale 20 g oak chips after fermentation has slowed down. 130 g Honey for priming (ca 4,5 g sugar / l) I want this one to be sweeter and fuller than the last one. Also less CO2. The last one is quite tasty and I like Mandarina in it. Any ideas or input is more than welcome. Jokes about menstruation are NOT funny! Period! I have been thinking of using 2 cans and making 20-22 liters. Nottingham yeast or other high attenuation. Maybe wheat or light DME for higher alcohol. I have the idea that it would make some sort of Imperial Stout. Bitterness would fade over time I guess. What do you think? Thanks! Your information will used for my next batch. Thanks! I've been a long time lurker. It's actually Hallertau Blanc from which I've gotten the impression is nice for late addition. https://www.hopsteiner.com/variety-data-sheets/Hallertau-Blanc/ Have'nt tried it yet but the descriptions seem to fit with the tastes I'm getting with this beer. Sort of a easy fruity Porter. Baltic Porter seems nice. I'll keep it in mind for future brew adventures. I have no temperature control so maybe with MJ M54 Californian Lager Yeast. Right now my garage is filled with cheap Coopers Porter and Bootmaker cans from a sale. Got some Tiny Rebel Cwtch kits waiting as well. I forgot to mention that I also had added nutrition for the yeast. It was a no-name packet made for fruit wines supplied with a bunch of other stuff I bought for my wine making. I did a Porter with 1.6 kg honey --> I must say I'm very satisfied with the brew.